For some Christmas is the time for family, however, New Year’s Eve is the time for friends. Whether you’re looking for a lively escape in a big European city or want to ring in the new year in the privacy of a luxurious and spectacular hideaway, our global experts have come up with this fabulous roundup of perfect villas and chalets to cap off 2017 and hail 2018…. perhaps even in the comfort of your own private night club! Bring 18 friends together for an unforgettable New Year’s Eve in the chic Swiss ski resort of Verbier where you’ll find amazing skiing, a lively festive ambiance and your own private nightclub at the extraordinary Chalet Truffe Blanche, in the exemplary repertoire of Ultimate Luxury Chalets. One of Verbier’s most exclusive chalets, the sprawling 3,000 m2 luxury rental is decorated in lavish Italian silks, rich textures and 17th-century inspired furnishings. The refined living areas feature gorgeous teak floors running and include a plush drawing room a formal dining room which seats 20 comfortably, two living rooms with roaring fireplaces and a French style library. Each of the seven suites and two superior bedrooms has been individually decorated combining classic elegance with modern comforts and design. There are two large terraces which have spectacular views of the surrounding mountains and valley beyond. The vast 1500m2 spa is an undeniable highlight. The Roman inspired wellness center includes a 15m indoor pool, an exotic Turkish hammam with Ottoman-style domes, a relaxation area with nine treatment rooms, a Finnish sauna, home cinema, sushi and vodka bar, wine cellar, pool table…. And its own private nightclub. Extending over 130m2, the nightclub includes everything you could possibly want for your own private New Year’s Eve party, from a much needed DJ booth, dance floor and sleek bar. You might not even need to leave the chalet on December 31st, however, if you do want to kick start or finish off your celebration, our local experts recommend the bar at Pub Mont Fort, Le Farinet or the renowned Farm Club. Many visitors also fill the main streets of the resort for some midnight cheer. Regardless of your exact plans, you’re guaranteed to have an incredible start to 2018 at this phenomenal chalet. Reach out to Ultimate Luxury Chalet here before the Truffe Blanche gets booked up by someone else! As tiny as Harbour Island is, it’s huge for the amount of fun to be had surrounding New Year’s Eve and the perfect stylish base on the island is the sleek House on a Dune villa which is still available through Pamela H. Murdock from December 26th to January 2nd. The five bedroom House on a Dune is an ultra contemporary and very cool house right on the island’s famous pale pink sand beach. This remarkable property is hidden from the road amidst 1.5 acres of tropical vegetation and sitting atop a 35’ dune. The contemporary villa was designed by an award winning architect who sought to create a structure that was “simultaneously powerful, yet comfortable; primitive, yet innovative; casual, yet elegant; raw, yet refined.” There is seamless indoor and outdoor living from its living and dining areas which open onto verandas protected from the elements by the deep overhangs of the gabled roof and retractable glass walls. Steps from the house, guests can take a short path down to the stunning pink sand beach. Inside you can also find a dining area with a table for up to 12, beyond which is the kitchen, which can be closed off by recycled cedar doors. The five bedrooms all have are ensuite baths, that of the master bedroom has a freestanding tub and shower. Ideal for both a family or a group of friends, find the right vibe for a fabulous New Year’s Eve in the Caribbean on beautiful Harbour Island by contacting Pamela H. Murdock at this link. Be in the heart of Rome’s historic and cool Trastevere district at the stylish Via Degli Orti, for ringing in the New Year in this an ageless city ideal. The festive season goes on into January so Roma will still be abuzz in the holiday spirit. Within the portfolio of Homebase Abroad, the property is located at the end of a quiet cul-de-sac at the foot of the Gianicolo hill, one of Rome’s original seven and today popular with local Roman families. The building dates back to the 17th century when it was constructed to house artists’ studios, a purpose it served into the early 20th century when the painters Giorgio De Chirico and Filippo de Pisis had a studio here. Currently owned by designers, the underlying essence of the building lies on. The particular configuration of both outdoor and interior spaces are one of the highlights of this beautiful city abode. This element is accentuated by the fact that the street itself receives very little traffic. The division of the bedrooms works well for both a family, or a group of friends or couples. Stop by a local market on December 31st to pick up some delectable local food products to be prepared in the apartments heavenly kitchen — a tasty start to your evening before heading out on the town. Trastevere is great authentic and central district where you have a number of the cities hidden gems at your doorstop. Amble through the area’s tin laneways, into its early ancient churches and over the the lesser know but stunning Galleria Corsini or the Orto Botanico. Back at the apartment you’ll find yourself in your own perfect private sanctuary. Contact Homebase Abroad here to start planning a local Roman New Year’s Eve escape. If you would like to escape to a warm and lively destination for NYE 2018 them Cape Town is the right place to go. The weather will be warm and sunny, there is a festive ambiance at bars and restaurants throughout the city as well as the V&A Waterfront’s annual New Year’s Eve bash and firework display. Alternatively, arrange your own private terrace party at the gorgeous La Rive Penthouse. Nicknamed the “Home in the Sky,” the luxury four-bedroom apartment was recently redesigned with an Art Deco feel. You can spend your days enjoying the apartment’s south-facing terraces with a fabulous infinity pool and breathtaking views of Robben Island, the Atlantic Ocean and the Metropolitan Golf Course and the Green Point Urban Park. On New Year’s Eve, gather your guests for some Cap Classic bubbly around the living room’s grand piano where you’ll also be surrounded by a number of paintings and sculptures from some of South Africa’s most important artists. You can admire the sunset and part of the fireworks right from her or the terraces. The layout of the apartment has positioned the large bedrooms in different areas, offering guests their own privacy. The building is found on the bustling Sea Point promenade with nearby access to Cape Town’s beaches, the V&A Waterfront, and a fabulous range of excellent restaurants are within walking distance. A 24-hour Concierge Service is on hand to welcome guests and assist with any needs you may have during your stay. Savor the sunshine, stunning views and fun atmosphere of New Year’s Eve in Cape Town at the La Rive Penthouse at this link. Have a fabulous fiesta over New Year’s at this one of a kind architectural marvel, located in the private gated five-star resort area of Costa Careyes, known for attracting free spirited artists and lovers of the sea from around the world, including movie producers, actors, writers and industrialists. The whimsical seven-bedroom villa compound, available through Villas and Apartments Abroad, is made up of three buildings, two swimming pools, a private beach and a grotto. The castle-like Tower is home to six bedroom suites, accessible via its grand spiral staircase, as well as various terraces where you can absorb your dose of vitamin D during the day and star gaze at night. Astounding views of the sea can be admired throughout. The Main Pavilion Tower is the compound’s central gathering place — the massive Mexican Palappa that extends the length of the building and features local woods and other indigenous materials carved by talented local artisans. The ground floor has a vast dining area and a large open plan airy living-room is found on the upper level. An additional two bedroom suites are located in the guest Annex, a fairytale ambiance with panoramic views of the lush forested scenery and the sparkling sea. The building also contains a floor to ceiling library of books in different languages, the ideal place to slip away for a moment to peace. The villa is fully staffed with a live-in butler, chef and maids (who have their own quarters) who can help you plan the perfect in-villa New Year’s Eve party or fill you in on other festivities nearby. Start the new year off on the right foot by arranging some in-suite spa services or if you’re artistically minded, there is an artist atelier that is available on request. Learn more about this unique property by reaching out to Villas and Apartments Abroad at this link. Celebrate le reveillon French style at an amazing and truly unique luxury rental just minutes from the heart of central Paris. Found on the exclusive Île-Saint-Germain, a lush island in the heart of Issy-les-Moulineaux, this massive four-story villa by Haven In boasts cathedral ceilings, skylights, an elevator, and custom-made furniture. A stay in this extraordinary four-bedroom rental starts at the foot of the Eiffel Tower where your chartered boat and captain will greet you with champagne to sip on your leisurely 30-minute cruise westward along the Seine to your private dock. Here a tranquil oasis, decorated with original sculptures and complete with a teak terrace and heated pool, awaits. The living area on the main level is perfect for festive entertaining with a custom wood and steel bar and huge, retractable bay-style windows that open onto the terrace, pool, and garden. A double-sided fireplace between the interior living and dining areas creates a seamless flow between both spaces and a cozy feel in winter. Guests can enjoy seasonal feasts around the large dining table which can seat up to 12 and is adjacent to a professional, eat-in-kitchen. The kitchen also gives onto a covered outdoor dining terrace. The second floor features a comfortable music room, with a beautiful Steinway & Sons grand piano and a multimedia room that can be used for watching movies whereas the third floor hosts an eclectic library with over 800 books collected by a lover of Brazilian and world literature. Three of the villa’s four bedroom suites are located on this floor and the expansive master bedroom suite takes up the entire top floor. Have a original Paris experience this New Year’s at this divine island retreat through Haven In here. Enjoy the perfect romantic New Year’s Eve by staying in a private palazzo on Venice’s Grand Canal, the luxuriously appointed three-bedroom apartment Canella. Located on the third floor of the outstanding Palazzo Ca’nova, available through excellence.villas by Trust & Travel, within a stone’s throw of the glorious Piazza San Marco, you’ll be able to easily take in the festive ambiance of the city all the while having your very own central hideaway. The gorgeous historic palace features three recently renovated apartments which have been redecorated in a pure, classic style with a contemporary twist. Surrounded by this superior comfort and sublime beauty, you will feel spoilt and privileged over the holiday season. In addition to the spacious apartment, you will access to a inviting terrace, shared by all guests of the Palazzo. There is also daily maid service each morning and a private secretary is available to assist you with anything you may need during your stay. There is a wide variety of excellent restaurants and shops in the vicinity, among which the famous Harry’s Bar, declared a national landmark in 2001 by the Italian Ministry for Cultural Affairs. Countdown to 2018 from the rooftop of this treasured location by contacting Trust & Travel at this link. Base yourself in Marrakech’s fashionable La Palmeraie district for an exotic and chic start to 2018. You’ll find everything you would need at the gorgeous five bedrooms Dar Marja villa by Villanovo, bringing together oriental spirit and contemporary luxuries. 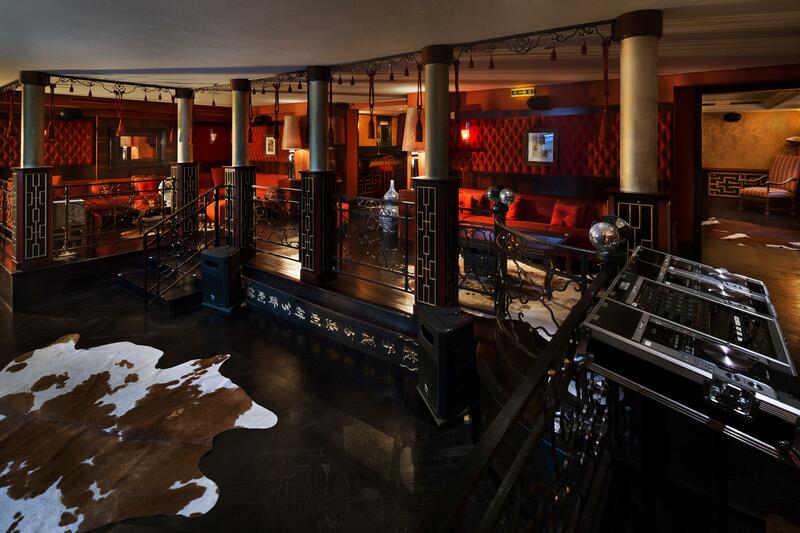 The attractive oriental style villa offers space and elegance in this vibrant Moroccan city. The villa is organized in the tradition Moroccan style of building surrounding a central terrace opening onto the pool and garden. The upper level terrace has awe-inspiring views of the Atlas mountains and the bedrooms each has a fireplace and ensuite with either tub or shower. The villa also has a private heated pool, tennis court, hammam, massage room, pitch and putt and large garden. No trip to Morocco would be complete without enjoying some delicious local cuisine, and why not a whole feast for your New Year’s Even celebrations prepared by the villa’s talented chef. Enjoy a stylish and warm getaway to Marrakech at this beautiful villa through Villanovo here. Avid skiers looking to celebrate the new year at the perfect ski in ski out chalet in a posh Alpine resort, need look no further than Chalet Edelweiss by Ultimate Luxury Chalets. 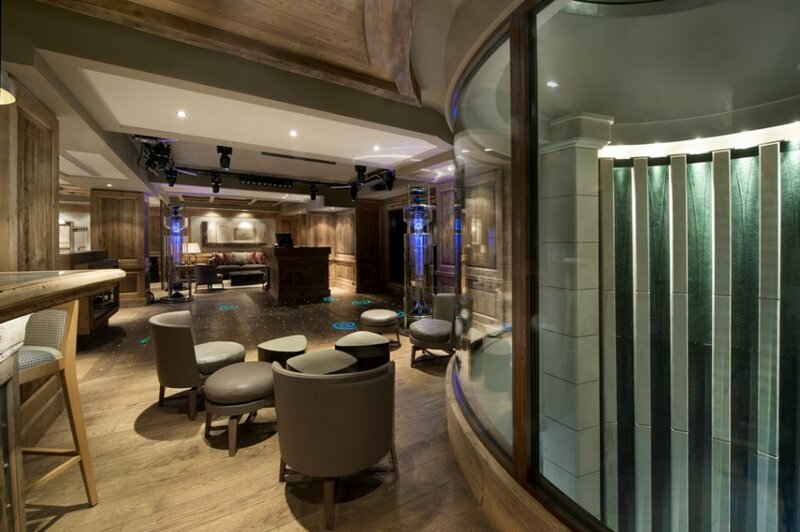 Located in glamorous Courchevel 1850, the eight-bedroom chalet has a 50m² ski room opening directly onto the Bellecote piste and its very own night club, so you can ski all day then dance the night away on December 31st. The six-level chalet’s elegant lounge and dining areas radiate charm and feature gorgeous views of the surrounding mountains and pistes. Here you’ll find a large dining table that can accommodate up to 24 people. All of its eight bedrooms have the latest furnishings, fittings and ensuite bathrooms. The two master suites are both 100m² each and the main one is comprised of two dressing rooms, a private lounge, bedroom and bathroom. The spa floor has a high tech gym, double massage room, hammam, sauna, 13m x 4.50m swimming pool with Jacuzzi featuring a waterfall surrounding a skylight, a bar and relaxation area. On New Year’s Eve get ready to party the night away in the chalet’s 130m² nightclub, which can actually accommodate over 100 people and has a DJ booth, dance floor and bar. On other nights, you can relax in the state of the art private cinema or library. Make the most of chic and festive ski holiday at the Chalet Edelweiss through Ultimate Luxury Chalets here.